New York Fashion week heralds the start of an international Fashion Month, and it got off to an interesting start! A mix of designers chose the traditional route of putting their collections for next season (Spring/Summer 2017) on display, while others offered the "see-now, buy-now" approach with Fall 2016 shows. Let's discuss a trend I saw across the Spring/Summer 2017 runways: pinstripes. Traditionally associated with conservative men's business suits and even baseball uniforms (! ), let's take a look at how designers interpreted the pattern for next season's womenswear. Carolina Herrera created a polished dress with embellishments at the shoulders, using sparkling crystals to juxtapose the dark pinstripe pattern. At Michael Kors, pattern play was the name of the game, with a wide-lapel pinstripe shirt under a checkered jacket. Paired with a floral skirt, it had a flirty-utilitarian feel. 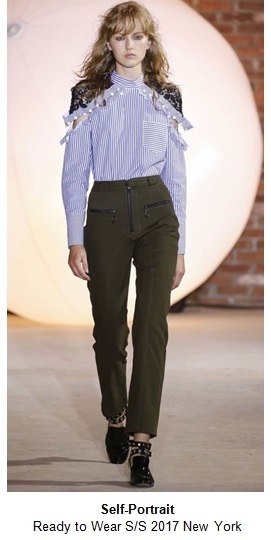 Ralph Lauren used one of his favorite Western motifs on the Spring/Summer '17 runway, but he incorporated pinstripe pants in lieu of denim for this look. Jenny Packham showed a gorgeous pair of wide-leg pants with an embellished pinstripe to up the glam factor. Self-Portrait had a variety of pinstripe looks on the runway, including this blouse featuring pearls, lace and cutouts, for a quintessential feminine menswear piece. Tibi's pinstripe suit was oversized and light, giving an easy, luxe spin on the traditional striped 2-piece. Tome offered a relaxed, modern silhouette with a peplum top and midi pants in the pattern. At Alexander Wang, pinstripe was incorporated throughout the collection, and his new take on the wrap dress featured a cool ombre effect. Whether you're going for a sporty, elegant, modern or cool style, try pinstripes to give your look a twist. How will you incorporate this look into your wardrobe?